"Global Computing for our Complex World"
"FuturICT - New Science and Technology to (Explore and) Manage our Future"
"FuturICT - Participatory Computing for Our Complex World"
"Data is the new raw material of the 21st century." Tim Berners-Lee and Nigel Shadbolt. "....our fates are interconnected; in a global economy, nations will rise, or fall, together." Barack Obama. The ultimate goal of the FuturICT project is to understand and manage complex, global, socially interactive systems, with a focus on sustainability and resilience. FuturICT will build a Living Earth Platform, a simulation, visualization and participation platform to support decision-making of policy-makers, business people and citizens. FuturICT - Integrating ICT, Complexity Science and the Social Sciences will create a paradigm shift, facilitating a symbiotic co-evolution of ICT and society. FuturICT project wants science to catch up with the speed at which new problems and opportunities are arising in our changing world as consequences of globalization, technological, demographic and environmental change, and make a contribution to strengthening our societies' adaptiveness, resilience, and sustainability. The FuturICT project will do so by developing new scientific approaches and combining these with the best established methods in areas like multi-scale computer modeling, social supercomputing, large-scale data mining and participatory platforms. To learn more about the FuturICT, download overview documents below or see more here. Register to become an official supporter of the FuturICT Initiative, stay up to date with all the latest news and contribute to the project. 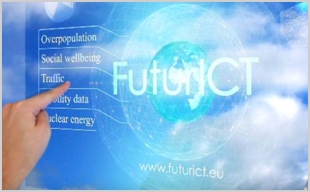 The work leading to these results has received funding from the European Union Seventh Framework Programme (FP7/2007-2013) under grant agreement n° 284709 - project 'FuturICT', a Coordination and Support Action in the Information and Communication Technologies activity area.